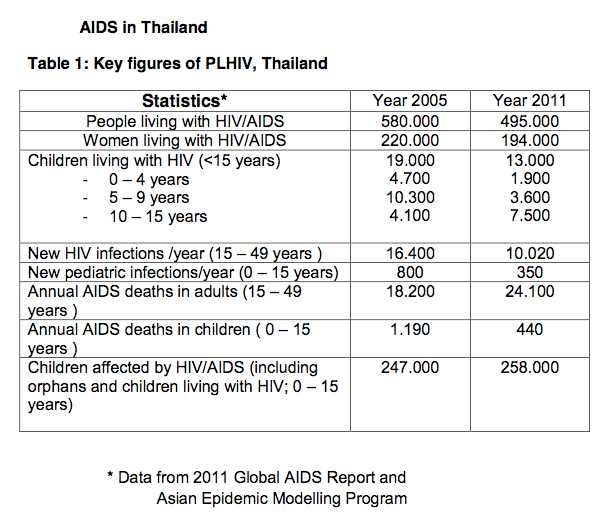 The official HIV/AIDS statistics in Thailand do not reflect the actual situation. Few of the people who are HIV-positive are aware that they have the virus and even fewer undergo HIV testing. There is strong stigmatization and discrimination of people living with HIV/AIDS in Thailand. Once a person is known to be HIV-positive, he or she may be blacklisted from the labor market and become an outcast of society. The United Nations Programme on HIV/AIDS (UNAIDS) stresses that a major bottleneck in the elimination of HIV/AIDS is the lack of basic information about the affected children: how many are affected, how many receive services and the main challenges involved. According to the 2012 Thailand AIDS Response Progress Report, stigmatisation is what causes affected families to be reluctant to seek and receive the full range of existing and necessary services. Children of people living with HIV/AIDS are in a higher risk group, as often parents do not manage to provide for the family’s basic needs. Apart from healthy nutrition, one of the most important needs for children is basic education. Often HIV/AIDS affected children have to start working at an early age. Terms such as ‘street children’ and ‘child prostitution’ are common. Some HIV-positive parents give their children away to welfare institutions because of poverty and despair. According to the UNAIDS report, many HIV-positive young people who are coming to physical maturity are experiencing treatment fatigue, and are uncomfortable disclosing their HIV status to prospective sexual partners. UNAIDS states that the children affected by HIV and AIDS are often viewed solely through a medical lens. A holistic approach to care and support is needed to address their needs, including care for psycho-emotional stress. Due to stigma, HIV statistics in Thailand are not precise. Most organizations believe that the numbers are much too low, especially when taking into account the tribal population. While the official number of people with HIV/AIDS in Thailand numbers 495,000 (2011), the number of people affected by circumstances caused by HIV/AIDS is much higher. It is estimated that 43,040 new HIV infections will occur in Thailand between 2012 and 2016. Out of 13,000 children living with HIV, only 6,510 received anti-retro-viral therapy (ART) in 2011. Once a person is known to have HIV, he or she has a high risk of being banned from the labor market and becoming an outcast of society.